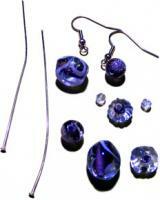 It is easy to make earrings using a head pin to create a simple drop. Quick to make, yet sure to impress, this technique will showcase your beads with style! When you make drop earrings with a head pin, always arrange the beads off the head pin before you start to make earrings. By getting the combination correct before you have made them, you can ensure that you won't have to waste head pins by remaking ones you want to improve. Drop earrings using a head-pin looks good when you have beads of different sizes. When you make drop earrings with the head pin, start with the widest bead at the bottom, and work your way up. These instructions use a lamp bead that is much wider than the feature beads, but shorter. This creates an interesting look when you make earrings with a head-pin, try using different widths and heights for the best appearance. lamp bead, purple/white swirled feature bead, purple/glitter feature bead, small crystal bead. Once all the beads are on the head pin, leave half an inch of the head pin exposed and cut off the remaining metal with the cutting edge of the pliers. Clamp the pliers on the head pin immediately after the top bead, and bend the head pin so that it makes a ninety-degree angle. Reposition the pliers at the end of the head pin, and roll the head pin back over to make a loop. Before the loop is finished, thread the earring hook through the loop. Close the loop with the pliers, and make sure that the earring hook cannot come out. Repeat steps 2-6 to make earrings that are a matching pair. Now you have finished this pair, you could make earrings using this drop with head pin technique in another color! The possibilities are endless, and the results can be amazing! query: INSERT INTO accesslog (title, path, url, hostname, uid, timestamp) values('How to Make Drop with Head Pin Earrings', 'node/15', '', '3.84.182.112', 0, 1555952431) in /home/surelion/public_html/drupal-4.6/includes/database.mysql.inc on line 66.